Where did all the humans go? The new look of Amazon.com warehouses. In a move that makes so much sense one wonders why it didn’t happen sooner, Amazon has acquired Kiva Systems, makers of the warehouse robot. The acquisition, which took place on Monday, cost $775 million making it the second largest in Amazon’s history. It makes so much sense because Amazon’s fulfillment centers are enormous warehouses where human “pickers” literally walk miles every day, retrieving books and t-shirts and coffee mugs. With more than 50 fulfillment centers around the world having about 20 million square feet, there’s a lot of room for improving efficiency and increasing profit margins. When I attended the grand opening of their new headquarters in Reading, Massachusetts last year I got a chance to see the robots in action. Their demonstration floor was a veritable dance of scooting robots and merchandise pods that continually zipped within inches past each other. It was extremely impressive – and fun – to watch. The Kiva robots do the walking – or rolling – instead of the pickers. They are low-riding, squarish robots that bring stacks of merchandise, or pods, to picker stations where their human coworkers grab the relevant items and transfer them to a rack where shippers then pick them up. Not only for order fulfillment, the robots do the heavy lifting for product replenishment as well. When inventory comes in a worker scans the product and immediately the proper pod is on its way to receive the goods. And the robots know that “to err is human.” So to minimize the errors a laser pointer system shows the pickers which box has the merchandise and which box it’s to be placed into. Keepin’ it simple for those easily fatigued humans. The acquisition also makes sense because, in a way, Amazon was already using them. Two companies previously acquired by Amazon, shoe-retailer Zappos.com and baby products supplier Diapers.com, were already using the Kiva robots to fill their orders. At $894.6 million, the Zappos.com acquisition remains Amazon’s largest. Other companies are also enjoying the efficiencies of robot run warehouses. Gap, Crate & Barrel, Staples, Saks 5th Avenue, and Walgreens are just some e-commerce giants that fill their orders with the sporty orange robots. The cost of Kiva robots can range from a few million dollars up to around $20 million. The fleet of robots is versatile. Their standard F-series robot can lift 1,000 lbs, Larger models can carry up to 3,000 lbs. Aside from making their ginormous warehouses even more efficient, Amazon’s acquisition makes sense for another reason. Not only will the robots tote around pretty much any product that fits in a box, the robots themselves are for sale. 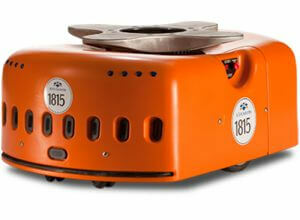 Other companies that want to bring the Kiva robots to their warehouses will now approach Amazon. So what does this mean for the more than 51,300 Amazon employees around the world? Although I find it hard to believe, the company has stated that it will not be eliminating any jobs as a result of the acquisition. Tuesday afternoon the company’s shares were up $7.69 to $193.21. Kiva was founded in 2003 by Mick Mountz, who was trained at MIT in mechanical engineering. Later he received his MBA from Harvard. For a time he worked for Apple as a Product Marketing Manager, then for Webvan, an Internet-based company that delivered groceries to a customer’s front door. Begun during the dot com bubble, the company quickly went bust. They couldn’t solve the problem of how to fill orders efficiently. It was his experience with Webvan that prompted Mountz to think of the robots. “We decided products that could walk and talk on their own would be the best way to solve the problem,” he said in an interview with MIT. It seems as though Jeff Bezos and Amazon would agree.